From Framed Bikes comes a limited release Alaskan Carbon Eagle 1x12 featuring Sram's all new XO1 Eagle 12 speed drivetrain, and a Framed Carbon wheelset. This build is sure to please the most discriminating rider. Available for a limited time at an unbelievable price. Other frame colors available upon request. Please call The-House.com sales to request a different color frame. Remember that superhero sensation you felt riding your bike as a kid? Those days where personal exploration and freedom of expression culminated into a sense of self-fulfillment unmatched by most experiences. The Alaskan Carbon strips away the mundane, responsible pavement commute and transports you back into that magical adolescent world of exploration. Climb and descend faster than a speeding bullet. Roll over features like a locomotive. Slay berms like a tracking grizzly. So, put your cape back on and leave the skinny tires to the real-lifers. Framed will change your way of biking! The Alaskan's stiff, lightweight frame and fork give you the confidence to attack and conquer terrain and conditions you had never thought possible. It will become the Swiss Army knife bike in your quiver. If you're looking for the best Carbon Fat Bike Fork on the planet, then stop right here! Our full carbon fat bike fork is the only one to have been tested and passed the German EFBE testing gauntlet. EFBE is the most respected and rigorous third party bike testing facility in the world, where 2/3 of all bikes tested fail. The Framed Carbon is the only fat bike fork to pass the EFBE test. This Carbon fork is stiff and light and will provide you with faster response and a much lighter feel as well as vibration dampening. This in turn will give you more energy to push further faster! It''s approximately 660 grams yet this fork can take a beating. Run it 365 or make it your winter fork. The Framed Carbon Fork pairs nicely with the Minnesota 1.2, 2.2, 3.0 and Alaskan Alloy and Alaskan Carbon frames or any other Fat Bike Frames that require tapered steerer type fork. 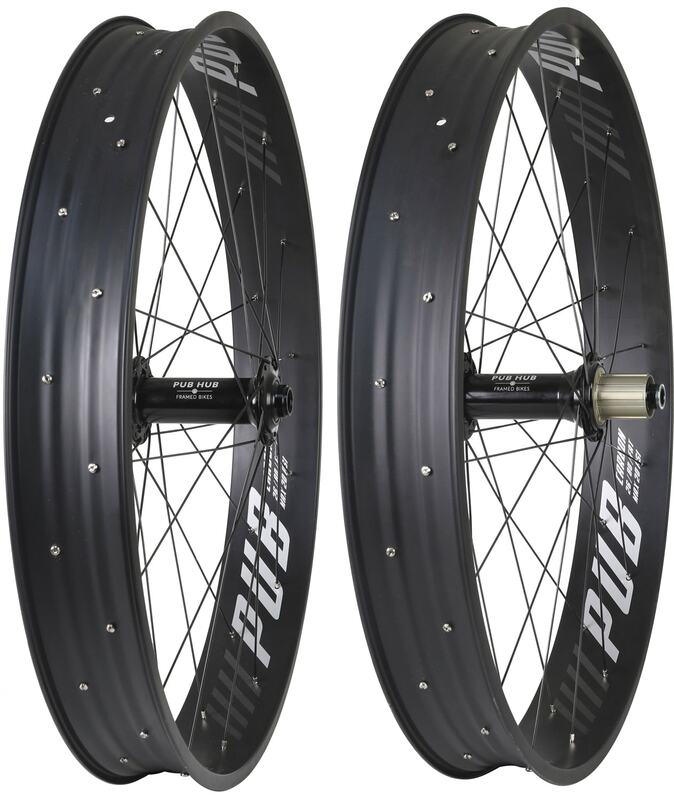 Framed Carbon fat wheels are the ideal upgrade for the fat bike rider looking to increase performance and decrease rolling weight. These 80mm wide rims are full carbon and feature a unique double/single wall system. Through the middle of the rim there is a single thick wall of carbon to support spoke tension. A double wall system is used near the edges of the rim near the tire bead to reinforce durability and rigidity. These wheels are tubeless ready and come equipped with Orange Seal tubeless tape pre-installed. Leave behind those misconceptions about fat bikes being heavy with this lightweight addition, ideal for all season riding. Did we mention these wheels are HANDBUILT IN THE USA!? That equates to quality that cannot be beat. Frame: FRAMED Exclusive Alaskan UD Carbon Frame 197x12. EFBE approved, integrated headset, replaceable derailleur hanger, water bottle cage braze-ons, internal cable and housing routing. Fork: FRAMED Exclusive ALASKAN UD Carbon Fork 150x15. EFBE approved, full carbon, oversized straight blade, tapered steerer 1-1/8" to 1-1/2", post disc mount. Fits wheels from 26" x 4.8" to 29" x 3"
Every Framed Fat Bike frame comes with a (3) year warranty. All components have a (1) year warranty, tires are excluded. The warranty covers defects in materials and craftsmanship, including manufacturing defects. The warranty does not cover any damages or defects caused by abuse, accidents or other incidents that are not the result of normal use of the product. See manufacturer warranty for more information. Warranty is valid for original purchaser only. 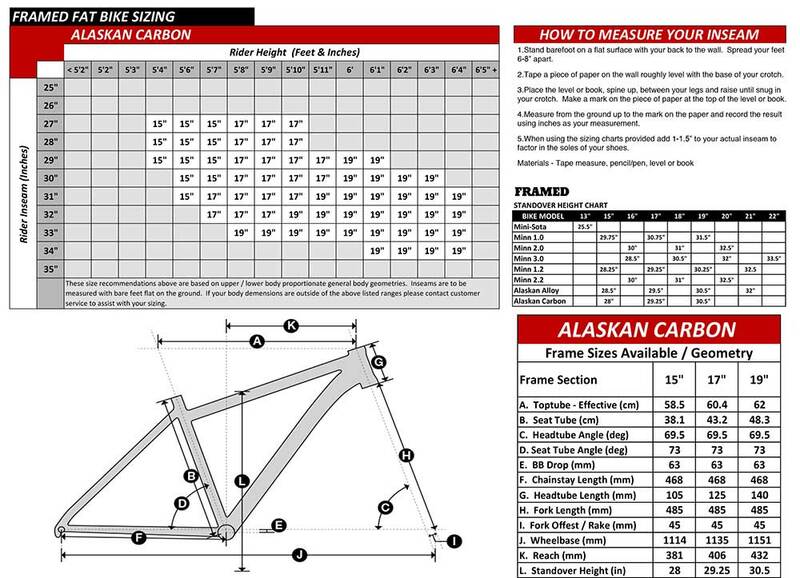 Framed has well established the Alaskan Carbon is not lighter, but it does like it rough! Do you ride for speed? Ultra-light, ultra-quick? Most likely the Alaskan Carbon is not for you. Do you ride like a bull through a china shop? Do you break bikes? Do you find unending ways to punish a bike in new and interesting ways? The Alaskan Carbon might be right for you. Chew on it, take some time, you’ll know what to do. 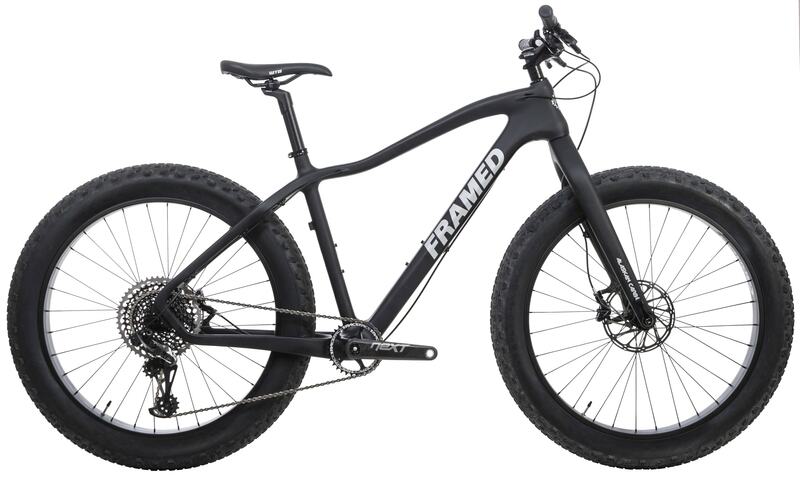 Kudos to Framed for goosing the system in the fat-bike industry. They may have a different vision than some of their fat-bike industry peers, but they are getting people on fat-bikes, and more people cycling is what the fat-bike is all about! Cheers to a Minnesota company. Alaskan carbon x01 has been a great bike. Very stiff and compliant. The carbon rims reduce the rotating mass very well. I ride this bike year round in Evey type of trail. I have the bluto on it now as the carbon fork was too rigid for trail use. The carbon fork is great for snow use. I bought this bike in August and took it on some trails to get used to it (which was great fun if you haven't ridden a fat bike before). This winter i have done 4 fat tire races and this bike hasn't let me down. When there are obstacles that require you to pick up your bike you will be very happy that you chose this very light carbon bike. 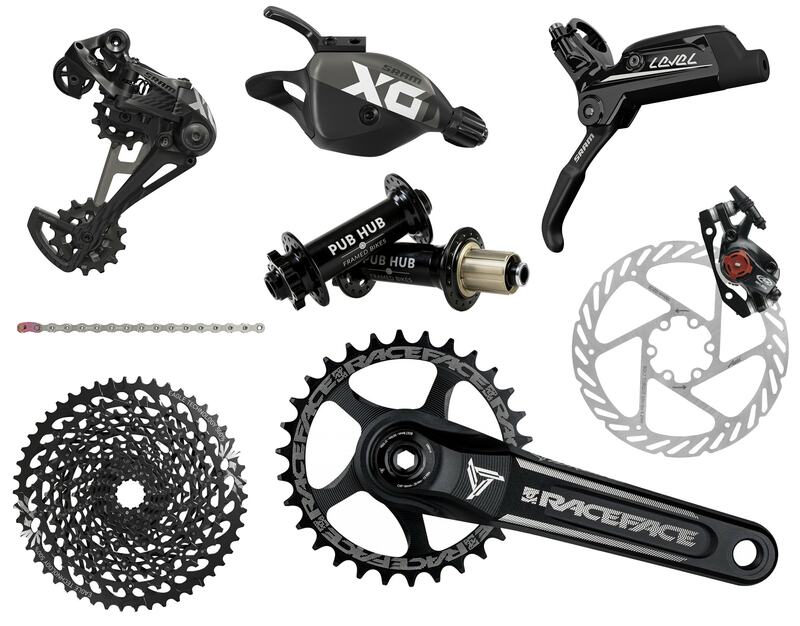 Also good luck finding SRAM X01 Eagle components on a bike that is under $5K. If you want an incredible bike with high end components and a blast to ride this is your huckleberry. BEST ANSWER: The tire is not tubeless ready. In order to safely and properly ride this bike tubeless you will need a tubeless ready tire. For further help..... please chat with Framed Bikes. Can you get a carbon fork for this bike that does have the braze-ons so that stuff could be mounted to the front? I checked with our bike shop, and the answer is no. I apologize. 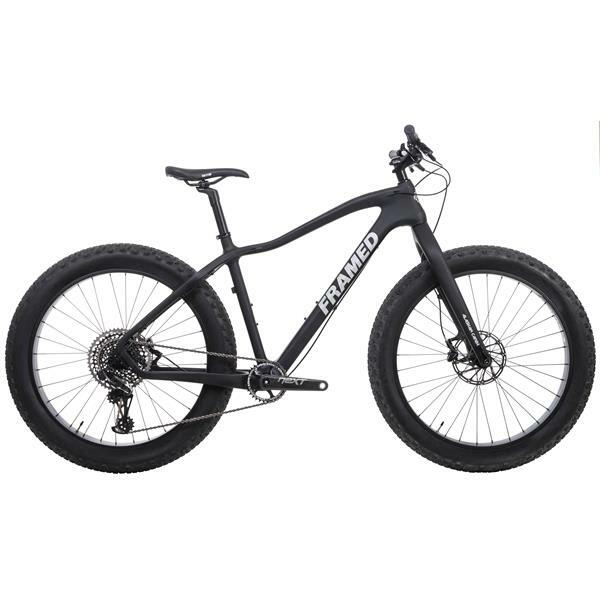 Which derailleur hanger do I need to order for this bike? I always like to have a spare. Can a front or rear rack be attached? I can't tell from my device if there are any attachment points. Thanks. A rear rack can be attached, but not in the front. This is true for all of the Alaskan series bikes. Will the bike accept a variety of tire sizes? What is the max tire size this will accept? 4.8" tire will be the max. how much more would it cost to have delieveried set up tubeless with a 4.8 tire with pedals? These wheels come with a tubeless rim strip already installed. Setting up the wheels tubeless then shipping the bike that way is not a reliable process as much can happen in shipping causing the tubeless bead to release, leak sealant, and create more work on the back end. We do sell tubeless conversion kits which you can add to the purchase so you're ready to convert when you receive the bike. We do not recommend using the Framed branded tires in a tubeless system. Back to the question which was what 4.8 tires DO you offer tubeless ready and what is the cost to have them installed since your weight is based on tubeless system? 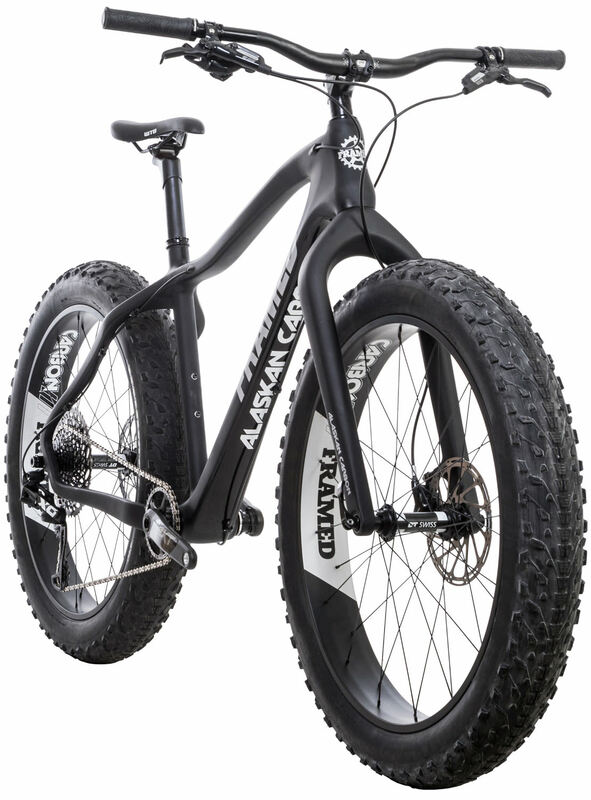 Does the Alaskan fat tire bike come with bike pedals? The Alaskan Series Bikes will not come with pedals.